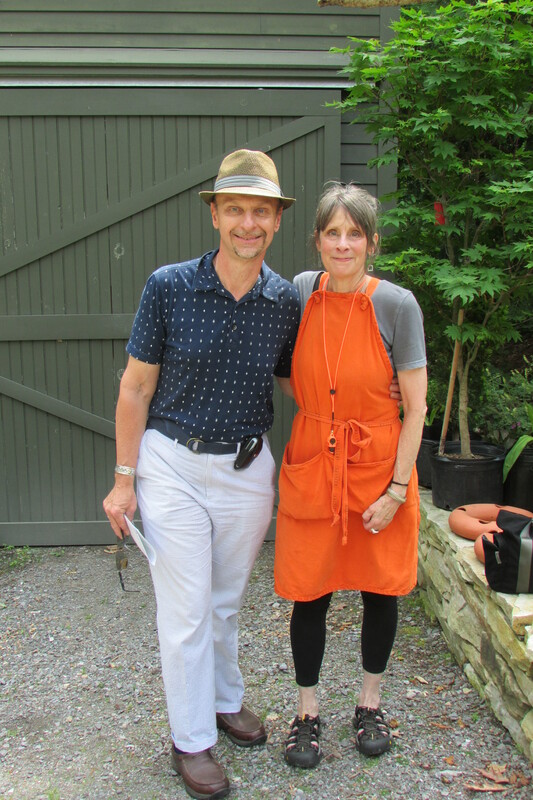 Margaret Roach and me at the June 2016 Garden Conservancy Open Day garden tour at her property in Copake Falls, NY. Since 1995 the Garden Conservancy has providing entrée into some of America’s most beautiful gardens with their Open Days Program. 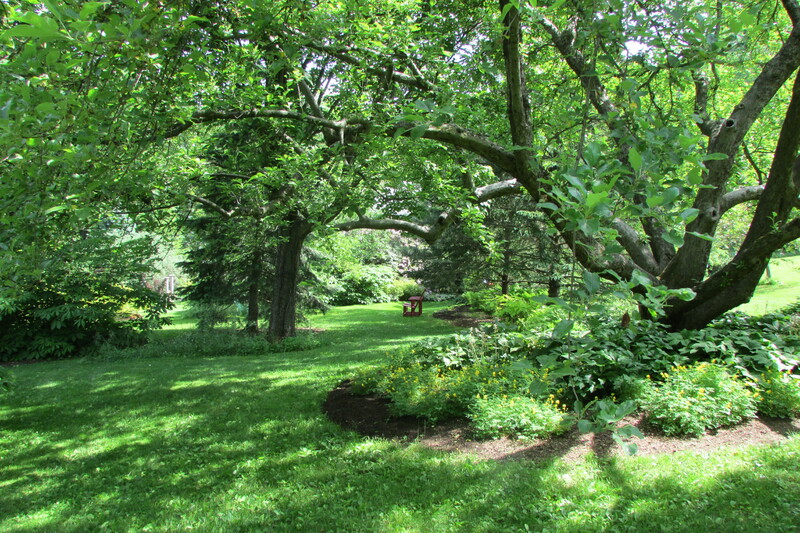 One of their most popular east-coast garden hosts is plants-women, author of three books, lecturer, past garden editor for Newsday magazine and then first garden editor, and later editorial director of Martha Stewart Living’s magazine, books and internet, national public radio talk show host and blogger, the multi talented Margaret Roach. 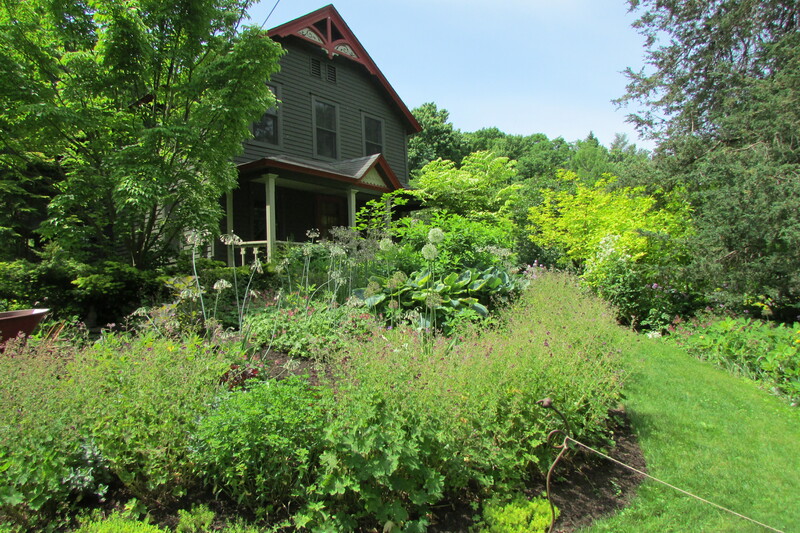 For years now, on specific days, Margaret has opening her Copake Falls, NY property to garden lovers from far and wide. 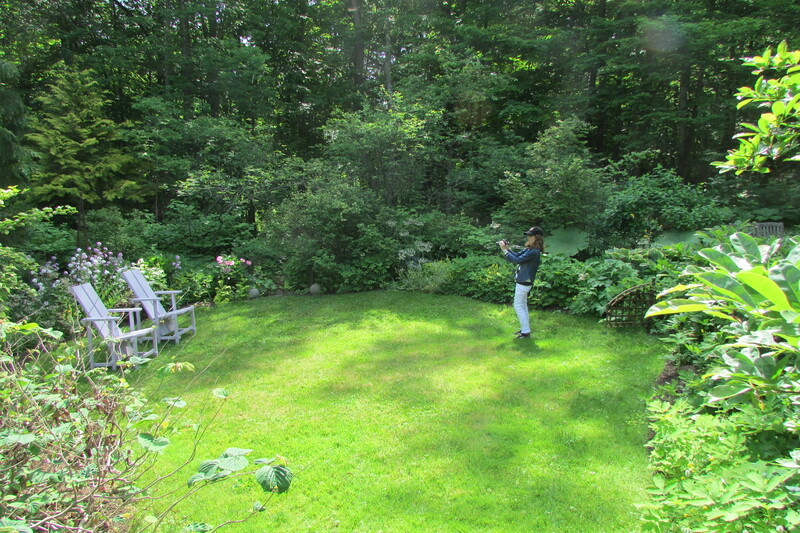 Recently my friend Marguerite and I made a trip to see Margaret’s 2.3 acres of paradise. I hope you enjoy my little tour. 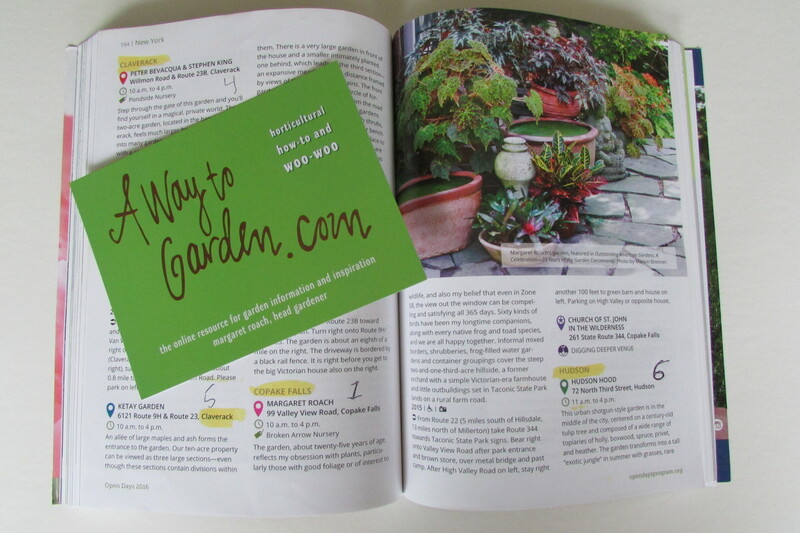 The Garden Conservancy 2016 Directory opened to the June 4th page with description and directions to Margaret’s garden, along with her business card. To me, Margaret Roach’s garden is really all about vista views, garden beds and borders that are curved, bushes and trees with interesting foliage, under-plantings below specimen plants, working with a specific limited number of colors for flowers, and the strategic placement of garden objects on the property for visual interest. The above photo says it all. 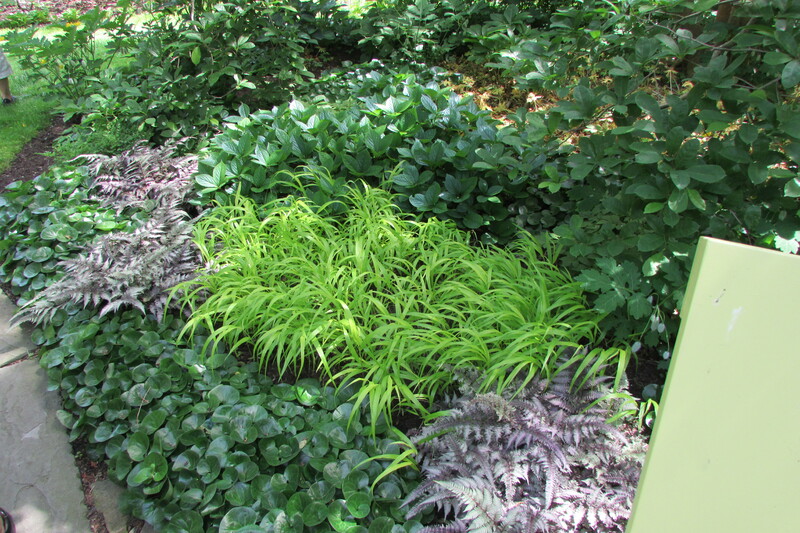 Notice how completely different kinds of foliage are placed next to each other in clumps that possess totally different leaf shapes (round, grassy, ferny, etc) and are in different colors (green, chartreuse, burgundy and gray). Also notice how the gray-purple color of the fern is repeated in more than one place in this ground cover bed to keep the eye moving. 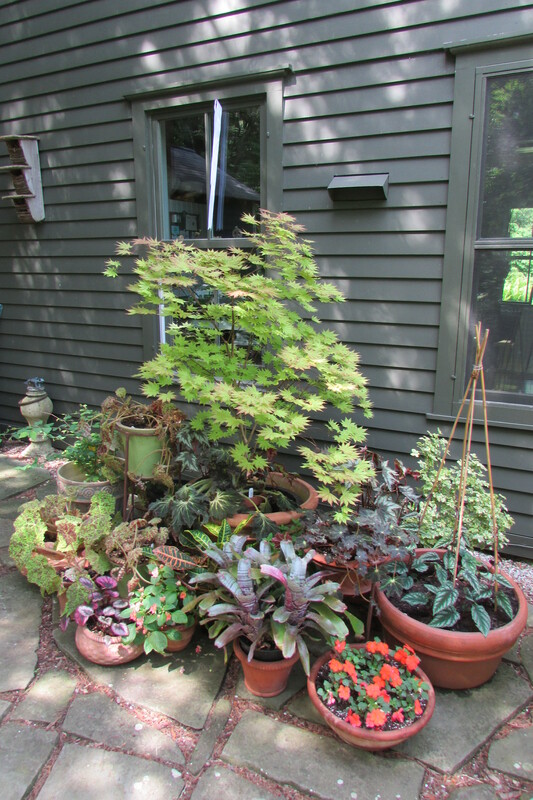 This small planting shows what Margaret Roach’s garden is all about; the creation of a tapestry using different colors, texture and shapes of foliage to make an artistic statement with plants. 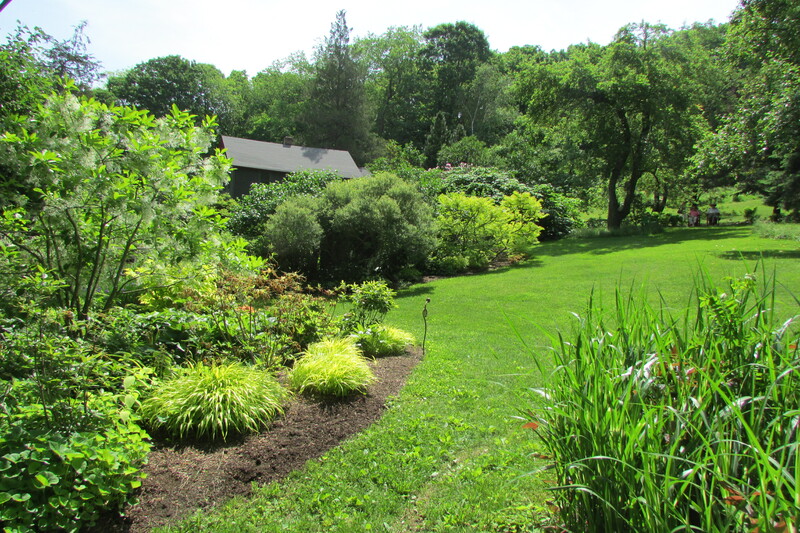 Click on photos to enlarge for closer viewing of Margaret Roach’s garden. This is the front of Margaret’s Victorian-era farm house. 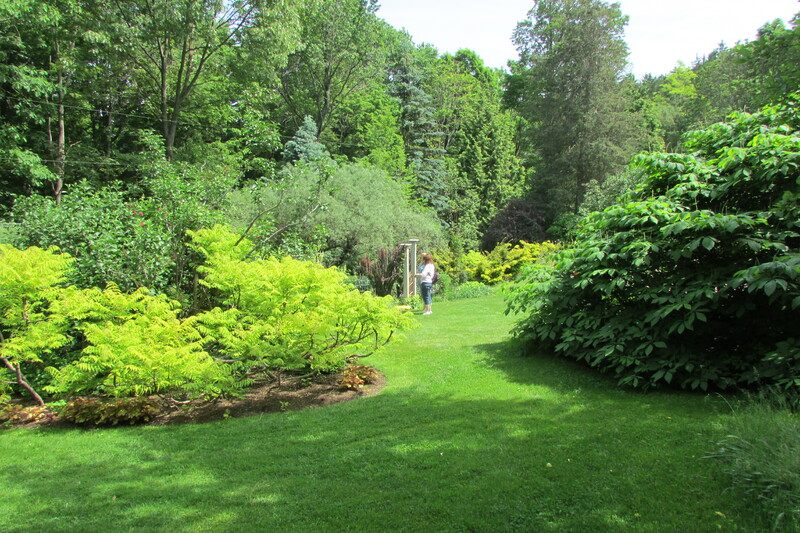 Notice how the plants look lush, grouped in mass, and how the chartreuse (yellow-green) of the under planting at the beginning of the grass path to the house is repeated again in the bushes in the distance. 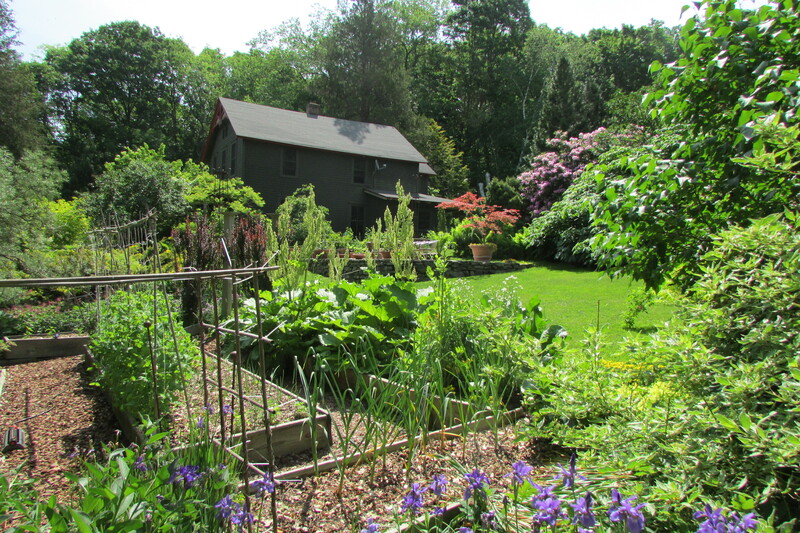 Gardening is really all about moving foliage and even flower colors along throughout a garden at ground level, mid level and even at high spots for visual interest and to keep the eye moving. Also notice how a palette of purple and lavender flowers are seen on both sides of the grass path to create balance and a kind of calm symmetry. Our first two spots of examination are the upper and lower garden rooms that are to the left of the house. Notice how the “Wave Hill” chairs have been painted the same lavender color as the flowers grown in these spaces. 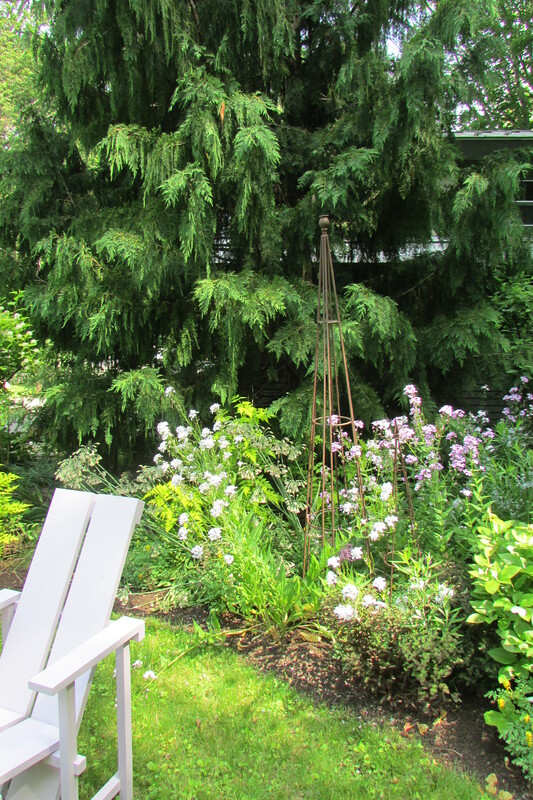 Different heights of plants (perennials, bushes and trees) that range from ground hugging, to mid range, as well as tallish specimen add visual interest to the spaces. The different sizes and colors of the leaves and needles of the plantings (in colors green, blue-green and chartreuse) make an eye-catching display. 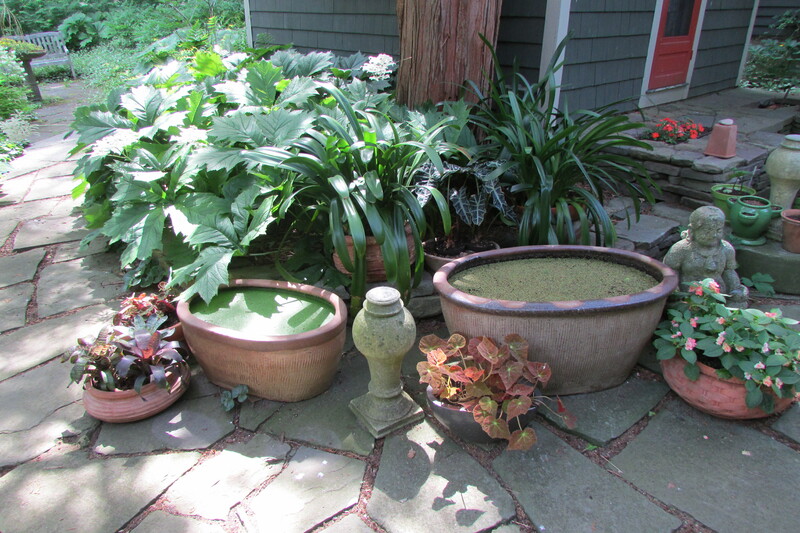 Close to the house, by the garden tour check in, is this welcoming collection of different heights of potted plants. Notice how the color of the house, its doors and trim are seen in the flower and leaf colors of the plants. 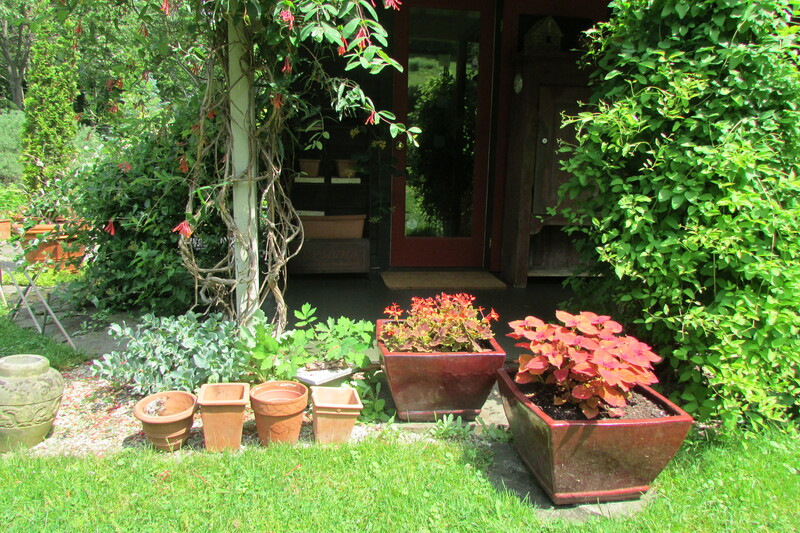 Look at how Margaret grouped the different shapes and heights of the plant containers, that are also in terracotta color, which is similar to the trim color of the house. 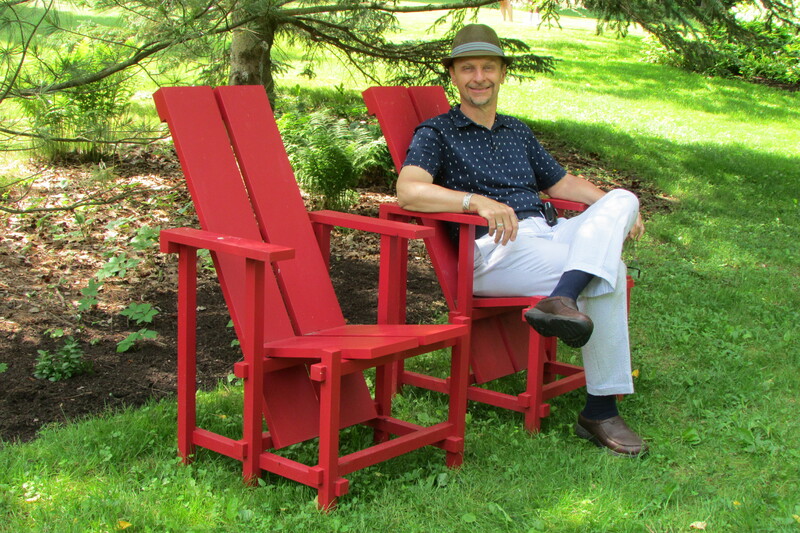 A second pair of “Wave Hill” chairs have now been painted chartreuse to move the color of some of the foliage plants to the other side of the side patio space. Next we’re heading toward the back of the house passing by some out buildings. 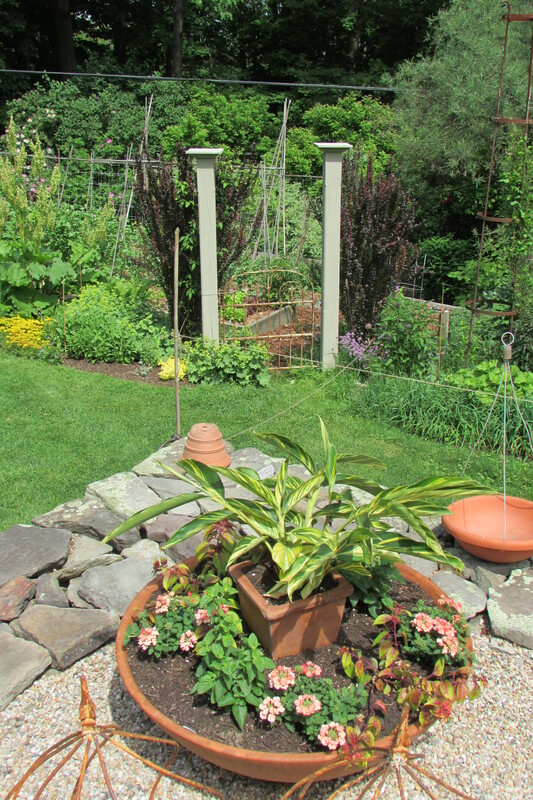 Different heights and shapes of planting containers add visual interest, as well as the different stone colored architectural elements and statuary. 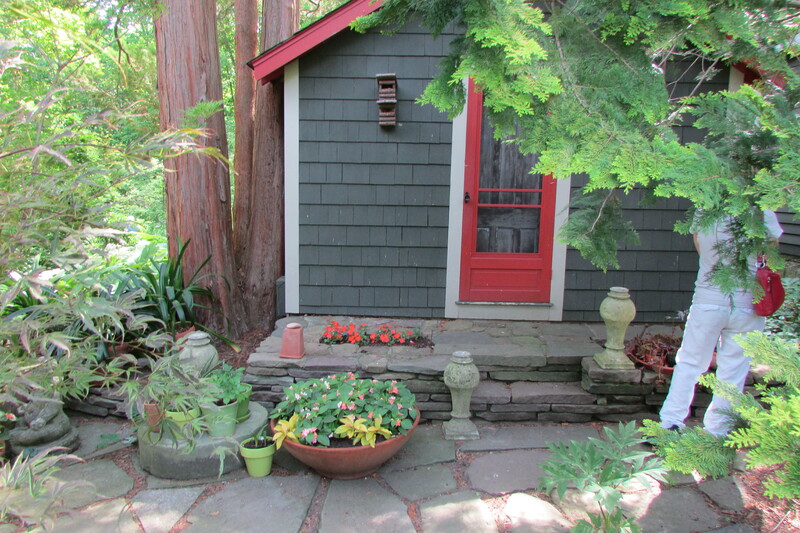 Again notice how Margaret used her garden’s signature “red-orange” color for plant flowers and foliage, as well as how the color of the architectural elements and statuary pick up the color of the paving stones. Looking closely at the photos you can see a russet colored stone or possibly mulch was used between the paving stones to keep the red-orange theme going. 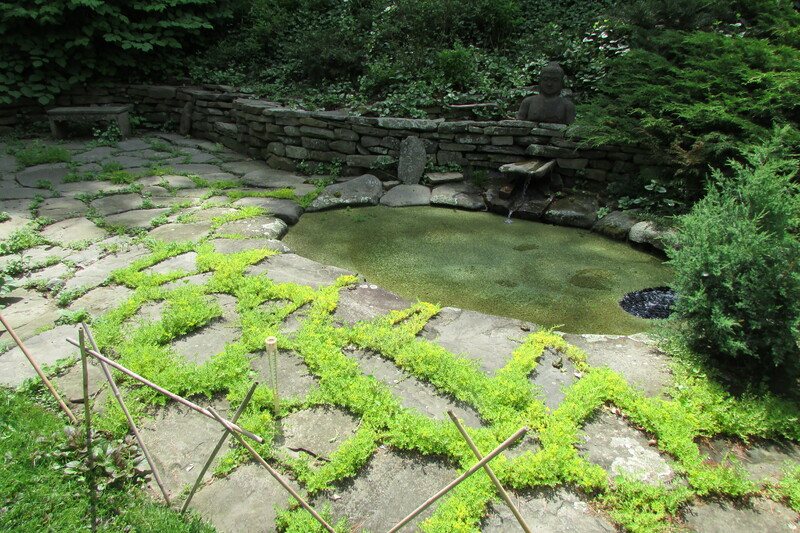 Now we’re back behind the house where two small pools are sheltered in a grotto area. 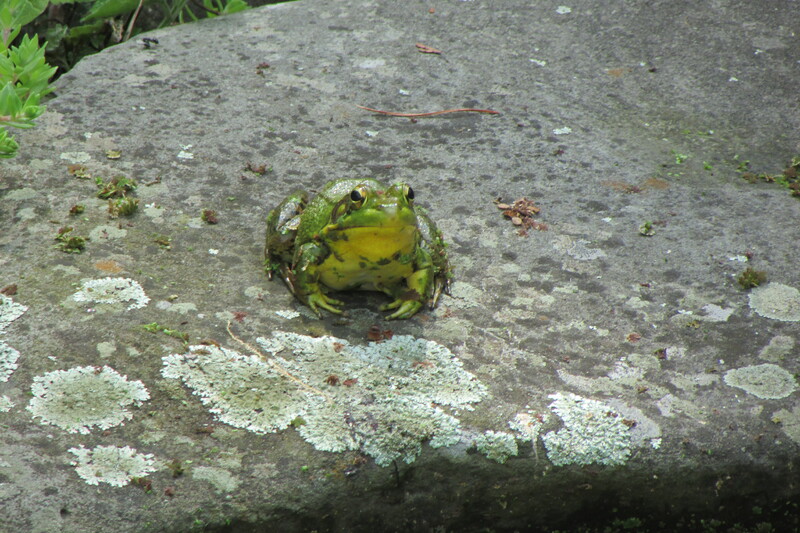 Margaret’s friends, that she calls the “Frog Boys”, fascinate and sing to the people on the garden tour. 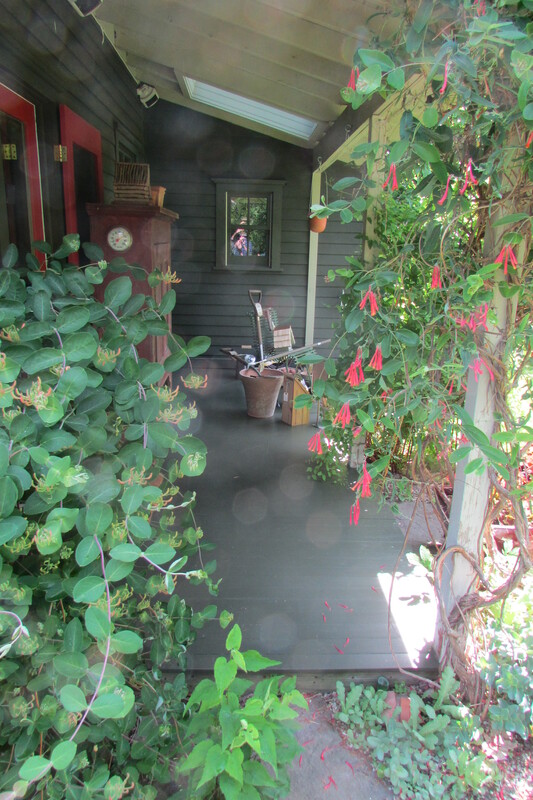 These two photos show Margaret’s pea stone floored patio, which is to the right of her house, and a view from it to the adjacent vegetable patch garden. Large paver pads, which were then sprinkled with pea stone, have been placed under the table and chairs to keep them from sinking into the small stones which create the floor of her outdoor eating area. 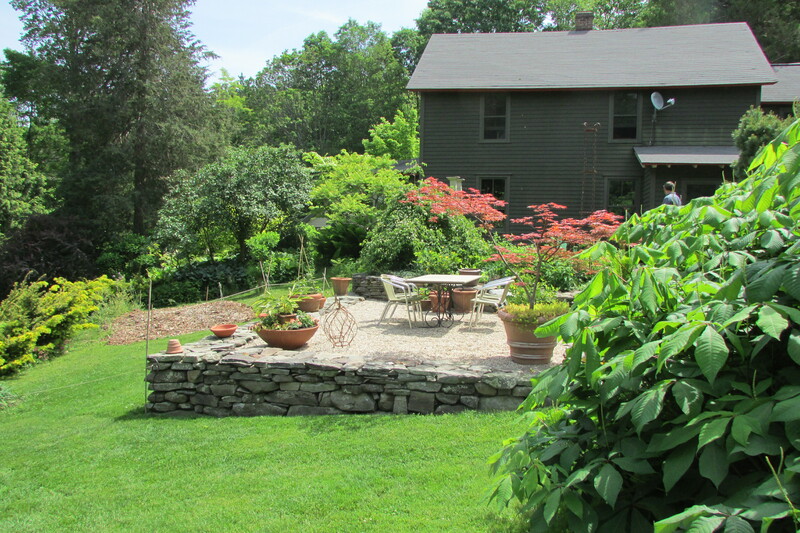 Everything on Margaret’s property is based on “curves”, except the house, the patio, and her vegetable garden. Notice how Margaret has worked the rusty metal texture from the elements placed on the corner of her patio (bottom elements seen in the second photo) to the garden gate in the distance. Also notice how the two columns that flank the gate, the bamboo supports for peas and beans, as well as the metal tower to the right draw the eye upwards, and are like sculptures in the garden. 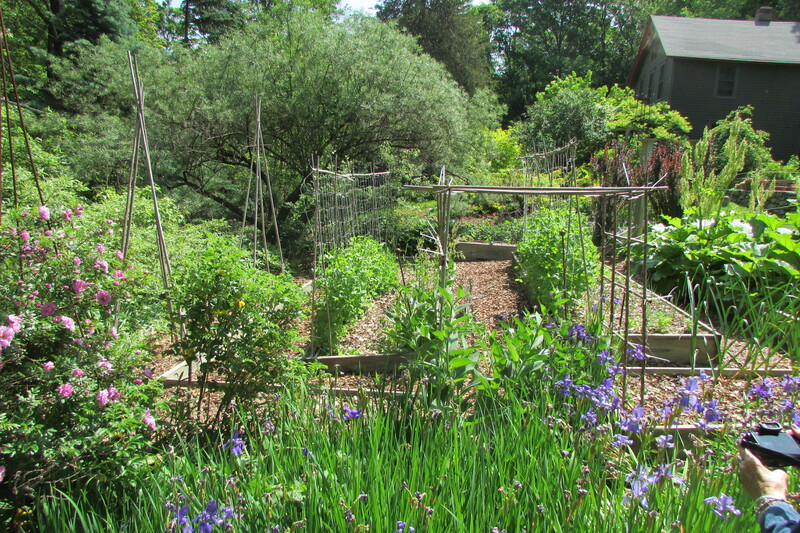 This is the view, looking north, of the raised vegetable garden which is close to the front of the house. An assortment of bamboo poles have been erected to support the many vegetable plants, which hopefully will produce a bountiful crop. Curved beds and vista views make Margaret’s 2.3 acres seem larger than it really is; at each turn you discover something different and special. 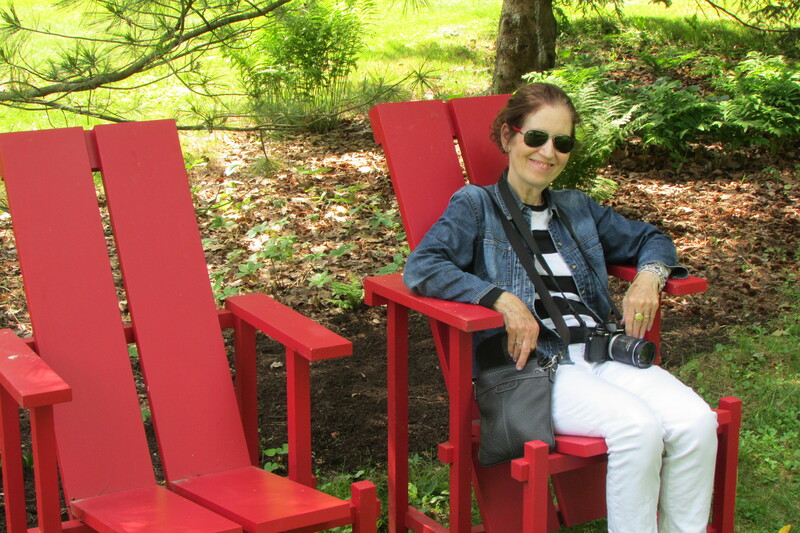 Four pairs of different colored “Wave Hill” chairs have been strategically placed throughout Margaret Roach’s property. Marguerite and I tried them out to test their comfort factor. 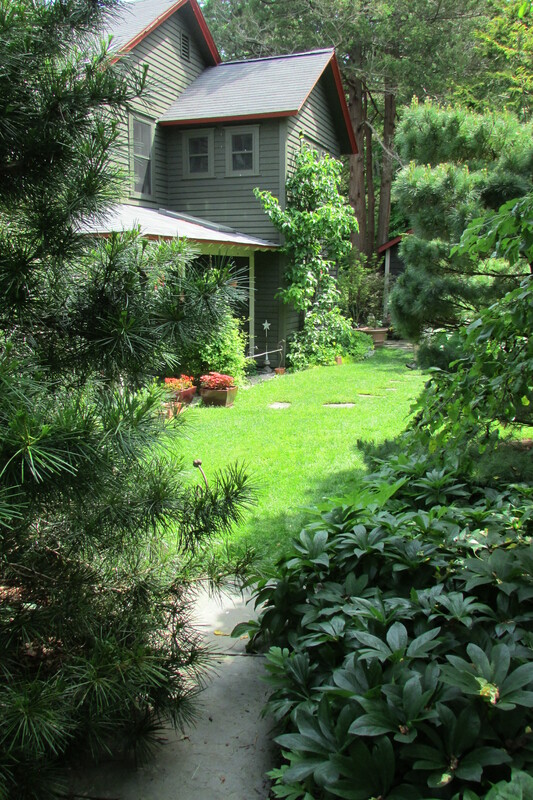 The under-planting of bushes and trees is constantly seen in Margaret’s garden. 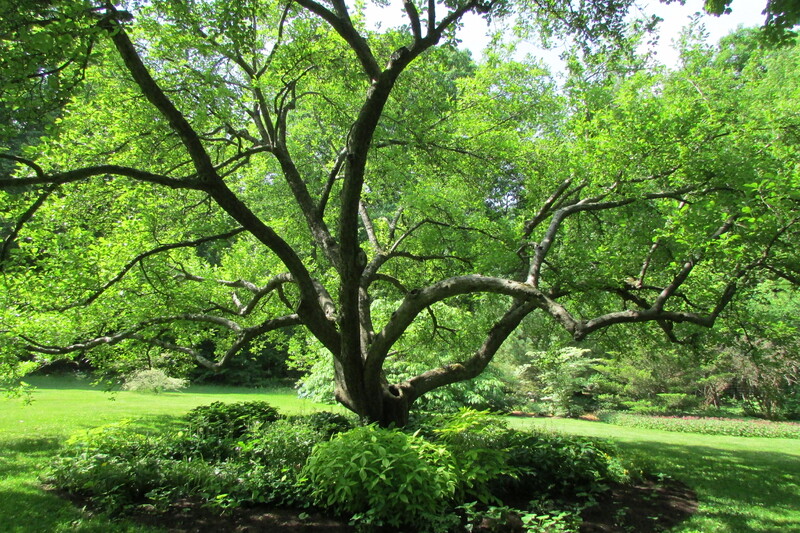 Here an ancient apple tree, which really looks like a living sculpture, is surrounded by shade loving plants. 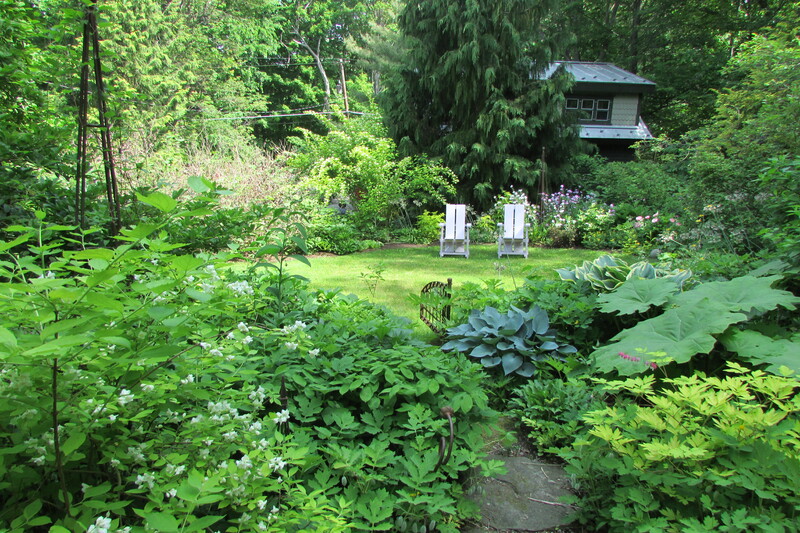 So now my little tour of Margaret Roach’s garden has comes to an end; there are soo many other things that I could show you, but a blog post can really only be soo long. 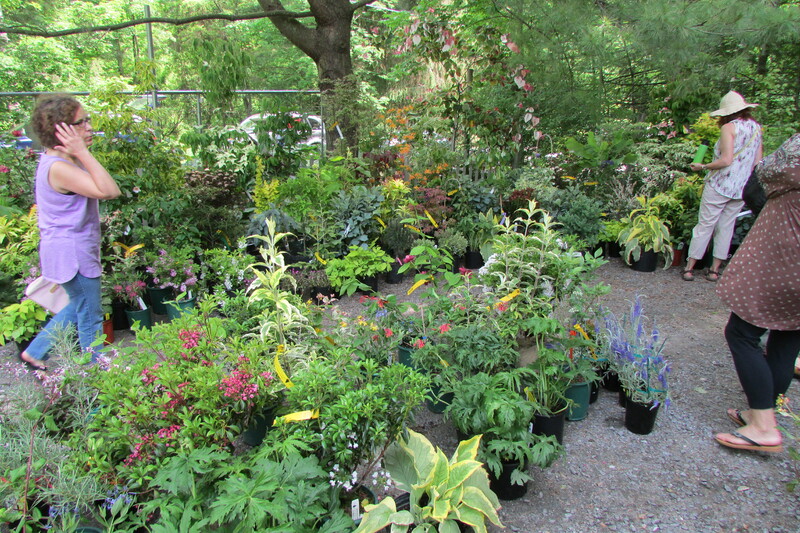 At the end of her driveway, Broken Arrow Nursery of Hamden, Ct had created a pop-up store, for the day, showcasing rare garden plants, shrubs and trees. What a wonderful souvenir of the Garden Conservancy Open Day tour of Margaret’s garden, if a person has some extra garden space to fill. 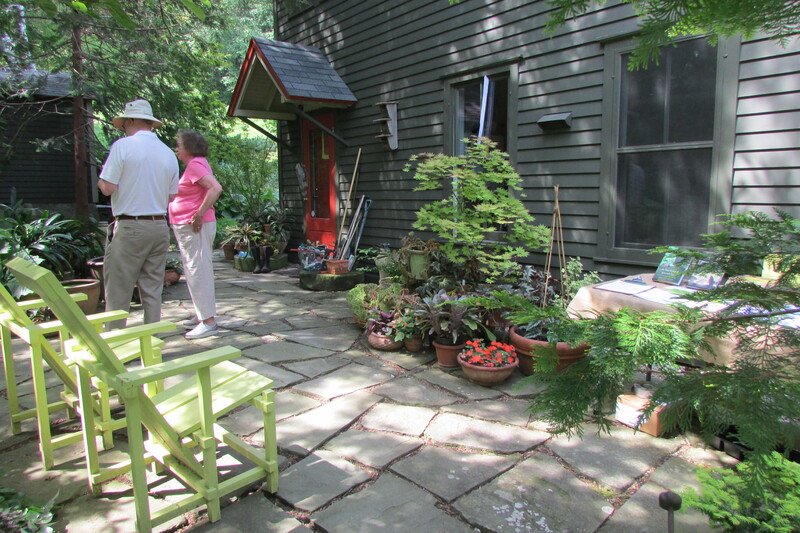 Our visit to Margaret Roach’s garden was our first stop of the day. We then drove 13 miles south to Millertown, NY to tour the many quaint stores, and have lunch at a pizza place Margaret recommended. After that we continue across bucolic Columbia county, and toured three more properties that day. Margaret’s place, Millerton, and the other Garden Conservancy Open Day gardens made for a wonderful adventure, too bad the gardens were not open for an hour or two extra, as we would have liked seeing two others. Oh Well, maybe next year. 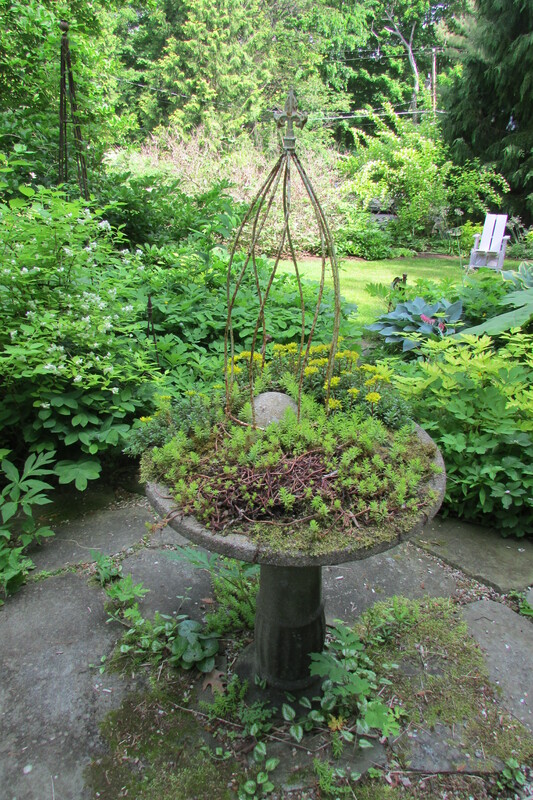 If you are interested in when the next Open Day for Margaret’s garden will be, or her blog, or if there are any upcoming Garden Conservancy Open Days in your area, or who are the purveyors of some of the planters and iron garden ornaments seen throughout her garden, they can be found in the first comment following this post. A Return visit to Spencer and Katrina Trask’s YADDO, Saratoga Springs, NY 9-29-2012. This entry was posted in Garden Visits (Road Trips). Bookmark the permalink.